“Again, thanks for producing the TURNER. As I told you, I expect that it is the same as an extra five years of life to me. The doctor reported at the time of my annual physical that all the bad things in my blood were much reduced from a year ago, and that it was a pleasure to examine someone whose numbers were in all ways better than a year ago. Since the only different thing, I have done is the 2000 miles of recumbent riding, I guess we’ll have to give that the credit. Thanks again, keep in touch. Jack”. From a memorandum by Jack R., a loyal TURNER customer. “I can’t believe how fast this thing goes! Since riding my TURNER recumbent I’ve gone from being a slow-poke on my old street bike to being the fastest guy in town. I now ride with groups of former-pro and semi-pro bicyclists on the weekends and always finish the ride first! The other bicyclists are always amazed at how I blast past them. I’ve safely achieved 63mph heading down 11,000 ft. high Mt. Lemmon in Tucson, Arizona! The TURNER is so easy to work with I easily attached a front and rear fairing kit, which added four mph to my highest possible speed. Yee-hah!” Jeffrey B., an industrial designer consulting in Tucson, Arizona. “As a physician practicing Sports Medicine for the last 30 years, I was recently introduced to a new type of bicycle (the TURNER) in which the bicyclist assumes the recumbent position instead of an upright position, leaning forward putting pressure on the handlebars. I am very impressed with this bicycle and feel that it is the bicycle of the future. This bicycle will guard against many injuries that people that ride conventional bicycles now experience. In my practice, I see a lot of ulnar nerve neuropathies or pinched nerves at the wrists secondary to gripping the handlebars. This bicycle will avoid that problem. I see a lot of problems with prostate irritation in men that ride conventional bicycles, due to the shape of the saddle seat. This bicycle will also eliminate those problems. I see strains of the abdominal muscles and back muscles in people that ride conventional bicycles because of the hunched over position that they must assume. This bicycle will eliminate those problems. I see people with chondromalacia or the patellofemoral joints that have a lot of aggravations riding conventional bicycles. That entity will also be avoided using the recumbent bicycle. Many of my older patients cannot ride bicycles because of the position they have to assume on a conventional bicycle, but with the new recumbent bicycle, they would be able to enjoy bicycling, which they have not done for 10-12 years because of problems with their joints, and the position assumed on a regular bicycle. Many of my senior citizen patients complain of lack of comfort on regular bicycles, but with the new recumbent bicycle, there is no discomfort when sitting in the seat. 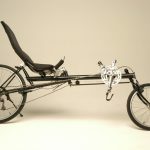 Many people have trouble getting on bicycles of a conventional nature, but with the recumbent bicycle, getting on and off is very easy, and the person with mobility problems getting on and off the bicycle can be easier. 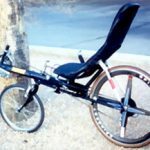 As someone who is limited physically, that person has a much better chance of enjoying bicycling with the recumbent bicycle. The seat is ergonomically designed with a lumbar support to eliminate problems with the low back, and my patients with low back problems would greatly enjoy riding the recumbent bicycle. I feel this bicycle is much more efficient in exercising the cardiovascular system than upright bicycles. After viewing and investigating this bicycle, I am completely sold on its design, safety and comfort. It is compact, lightweight, and is affordable in price. As a specialist in Sports Medicine, I would recommend this bicycle to all of my patients and also to children starting out riding bicycles. I have discussed this bicycle with leaders in Tucson in the Sports Medicine community, and they are impressed with the bicycle. 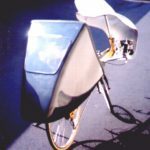 It was of note that a lady eight months pregnant rode this bicycle in the El Tour de Tucson bicycle rally in November 1994, and rode the full length of the El Tour (111 miles) and had no problems. 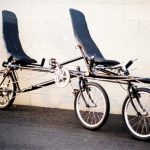 Anyone who is considering taking up bicycle riding should look at the recumbent bicycle before making a purchase of a standard, conventional bicycle. I will certainly start recommending this recumbent bicycle to my patients, and will assist you in any way to further your marketing of this product. 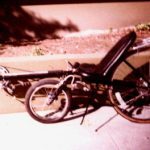 I also plan an article in the Arizona Senior World regarding the recumbent bicycle.” Sincerely, John P. Utz, M.D., Tucson, AZ.